I’m sure you’ve all heard the famous Hippocrates quote, Let food be thy medicine and medicine be thy food. He uttered those words in 400-something BC. Back in the day when food was actually—surprise—real food. That meant lots of plants and an occasional animal snack, but certainly not double-deep-fried, nacho-flavored, cheese-like chips; high-fat “Sunday” bacon; or 2-pound cinnamon rolls. When Hippocrates was talking about food as medicine, he was talking about plants. Whole foods. See those scrawny little scallions in the above photo? Nothing all that special. They’re just onions, right? Well, those onions pack a powerful punch when it comes to health-promoting goodness. I’ve been doing some research on foods that fight cancer, sometimes referred to as chemopreventive (or chemoprotective) foods and ran across an interesting, recently released (last week) study. But first, a little background. The term chemopreventive was coined in the late 1970s and refers to the phytochemicals (plant chemicals) in natural products (fruits, vegetables, herbs, spices) that reduce the risk of disease. I mentioned Hippocrates because I figured most of you have probably heard the food as medicine quote. Here’s another similar, although more wordy, quote from a March 2010 Pharmaceutical Research Journal abstract on cancer chemoprevention. Moreover, it has been recognized that single agents may not always be sufficient to provide chemopreventive efficacy, and, therefore, the new concept of combination chemoprevention by multiple agents or by the consumption of “whole foods” has become an increasingly attractive area of study. Hmmm? Wow, the “new” concept of consuming whole foods as medicine? An “increasingly attractive area of study.” Very interesting (I say with a touch of sarcasm). Wasn’t Hippocrates the father of modern medicine? Back in 400-something BC? Okay, so we’ve gone astray on many fronts when it comes to health and what we eat. I’ll save that rant for another day and get on with the exciting news about scallions, one of my favorite foods. There’s an increased risk of intestinal cancers associated with celiac disease. The risk is small and if you’re on a seriously committed and healthy gluten-free diet (think whole foods), the increased risk is minimal. I’m not losing any sleep over it. But colon cancer is one of the most common forms of cancers in the general population, so it’s nothing to sneeze at. 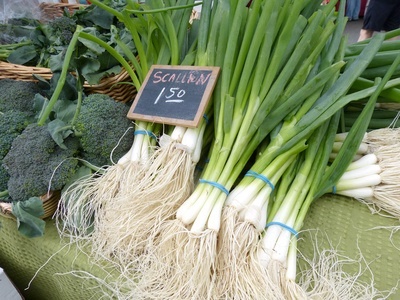 What do scallions have to do with intestinal diseases and colon cancer? Well, according to a new study, scallion extract (scallions soaked in hot or cold water) suppressed key inflammatory markers and reduced the size of cancer tumors. Yes, in rats, but in some ways, we’re not all that different. I say, load up on fresh, organic scallions right now. Chop them and add them to soups, stews, chili, whatever you can think of. Both the hot and cold extracts provided protection, but the hot (cooked) version topped the list. Sauté them and add them to raw salads. I do that all the time and they taste spectacular! Roast them in a medley of vegetables. Slice them length-wise and put them on pizza (check out this recipe: my new favorite pizza topping to see what I mean). Here’s the good news about this study. It didn’t take much, just one scallion a day to provide the extra boost in protection. If that’s not enough, scallions impair genes that store fat. Yes! Okay, in obese rats, but still. Good news, don’t you think? Onions also help lower blood pressure and are anti-inflammatory. What’s not to like about the scallion?! Go, buy some now! Let food be thy medicine! PS Stay tuned for a roasted scallion pesto recipe. Oh my gosh! Delicious. * P Arulselvan et al., “Dietary Administration of Scallion Extract Effectively Inhibits Colorectal Tumor Growth: Cellular and Molecular Mechanisms in Mice,” PLoS ONE 7(9), e44658. doi:10.1371/journal.pone.0044658, September 14, 2012. This entry was posted on Monday, September 24th, 2012 at 4:32 am	and is filed under Artful Aging, Celiac & Gluten Intolerance, Nutrition Therapy, Super Foods. You can follow any responses to this entry through the RSS 2.0 feed. You can leave a response, or trackback from your own site. Great news about the scallion! Thanks for doing great research. I appreciate learning new info that is so good for the body. And what’s good for the body is usually good for the mind as well:D I was aware of scallions being beneficial in lowering blood pressure and inflammation, but not chemopreventive. I include scallions in much of my cooking, but now I’ll have an even greater appreciation for doing so. I forget to buy and use scallions. Thanks for letting me know that they’re a healthy addition to our diet. Oooh, we love scallions! I had no idea that they were this powerful in their nutrition and healing though, and I don’t often cook them (sometimes with liver), so I’ll have to change my ways for sure. I’ve never been great friends with scallions. I think I’ll have to change my ways now that I have this amazing information about them. Very good to know they are as healthy cooked, as raw onions give me dreadful indigestion, (raw garlic no problem). Do you think these findings are true of all onions or specific to scallions? One thing for sure I will be growing scallions next year! Thanks for the info! I was a bit startled when I learned how close humans really are to rats. Kind of a funny thing, but those tests really are telling for humans.